A good heart rate variability is the expression of a working adaptability. Conversely, the risk of disease increases as the vegetative nervous system can no longer adequately adapt to external and internal stress. The HRV-Scanner is one of the most powerful HRV systems in the world. 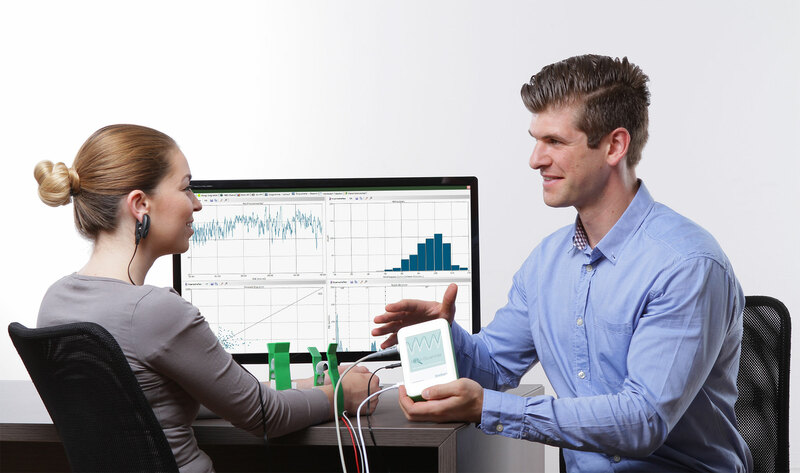 It combines the standard tests of the neurovegetative function analysis (Deep Breathing Test, Short-term HRV, Supine/Standing HRV and 24 hours HRV measurement) and HRV biofeedback in one system. In connection with the Qiu and myQiu it also provides the basis for effective HRV monitoring – this creates new possibilities for efficient therapy, control of therapy and training as well as lifestyle interventions. 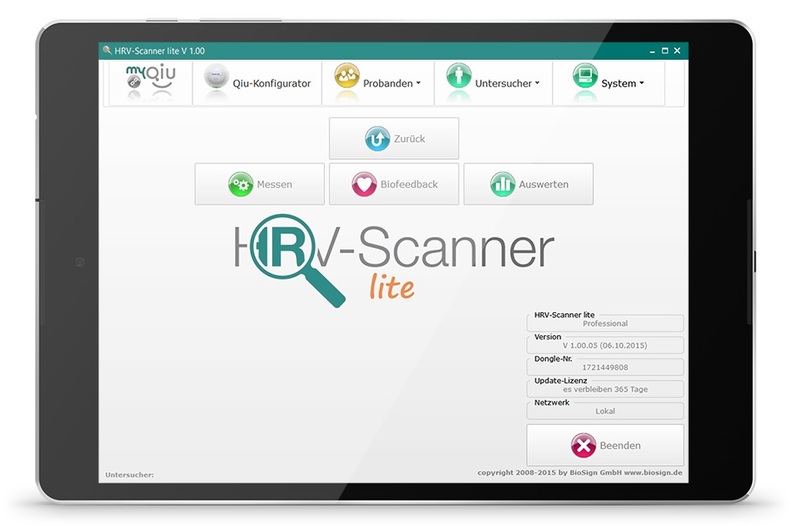 The HRV-Scanner is available as a tablet-compatible entry-level version (HRV scanner lite) and with all features in the full version. Upgrades from “lite” to the full version are possible at any time. The Deep Breathing Test is the gold standard in the HRV function analysis. The subject breathes for a minute in a given tact. This purely parasympathetic function analysis shows the current capacity of the maximal parasympathetic regulation capability. The 5 Minute Short-term HRV reflects the actual condition of the neurovegetative nervous system. Both branches (sympathetic / parasympathetic) of the neurovegetative regulation are examined under resting condition. 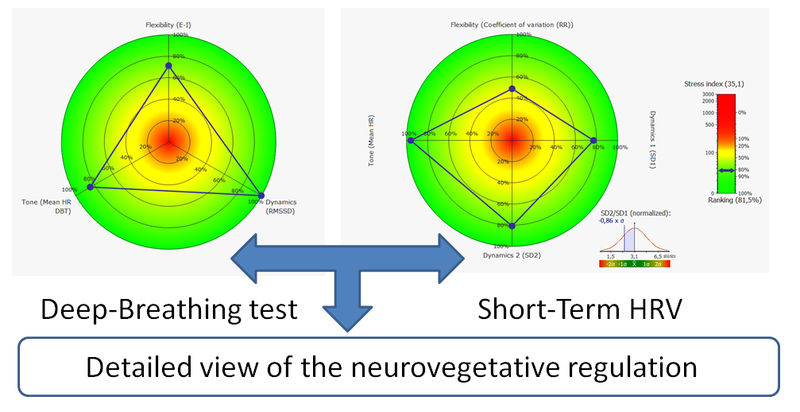 Only the combination of both measurements allows a differentiated and comprehensive view of the vegetativeum (VNS analysis). The HRV-Scanner also offers HRV monitoring and the 24-hour HRV measurement to provide a more accurate look at the regulation. Compared to a measurement using pulse wave or a chest belt, the ECG may also detect cardiac arrhythmias (for example, life-threatening atrial fibrillation or extrasystoles). Movement artifacts and rhythm disturbances can be separated clearly. If only RR intervals from a chest belt are available, the user is not able to postpone measurements. The decision when a heart beat took place is left to the “black box” chest strap. The HRV-Scanner derives the ECG from clamp electrodes at the wrists. This has the advantage that subjects do not have to undress. Alternatively, removal via adhesive electrodes is also possible. With the concept of flexibility, tonus and dynamics, the HRV-Scanner brings order to the extensive number of HRV parameters and VNS analyzes. Thus an age-corrected and easily comprehensible explanation model of the complex processes around the neurovegetative regulation is available. This saves time in communicating with clients and creates trust. In addition, all standard HRV parameters and HRV diagrams are available in the analysis. HRV measurement, HRV biofeedback and connection to myQiu / Qiu provides the HRV beginner with everything he needs in the daily practice application. In the development phase of the HRV-Scanner lite, we have paid particular attention to practical and intuitive usability of the software on the tablet. Tutorials built into the program make the application easier to use. When you purchase an HRV-Scanner, you will receive a personal training with TeamViewer. 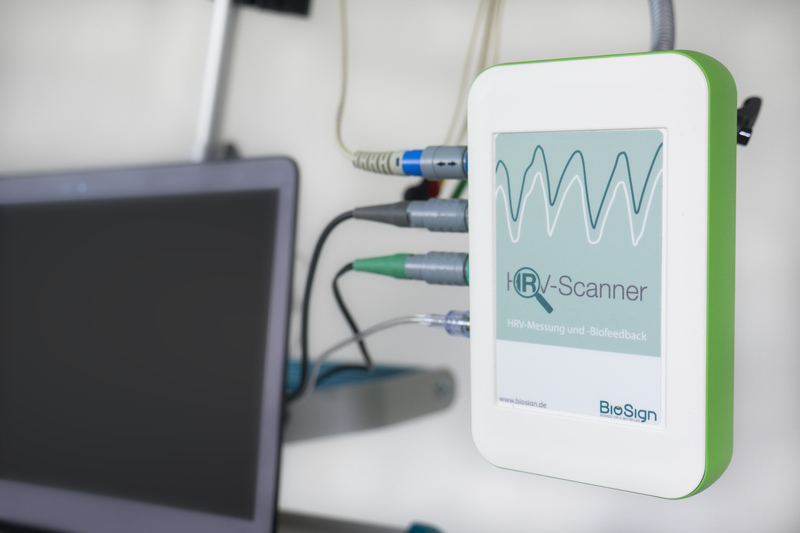 More info here .The license for using the HRV-Scanner lite software is included with the HRV-Scanner standard and HRV-Scanner plus. Information on the available versions and prices can be found here. The HRV-Scanner plus offers a 3-channel ECG, the measurement of breathing via a breathing sensor and a chest belt and the possibility of carrying out the Valsalva maneuver by measuring the air pressure via a pressure sensor. The device is certified according to the MPG. Long-term measurements (up to 24 hours), supine/ standing tests, many import options (HR and RR lists, ECG raw data, Polar, Suunto, EDF, SRM recorder data, …). The HRV-Scanner shows my patients how sensitive and fast our cardio-vascular system reacts to psychological stress and how harmful excessive stress can be. I have used the HRV analysis daily since 10 years. BioSign has set standards here. They have open ears for the needs of physicians, therapists and coaches, and can quickly and easily implement change requests from practice. I look forward to other milestones of BioSign’s HRV! The HRV-Scanner has become an important part of my basic cardiological diagnosis. 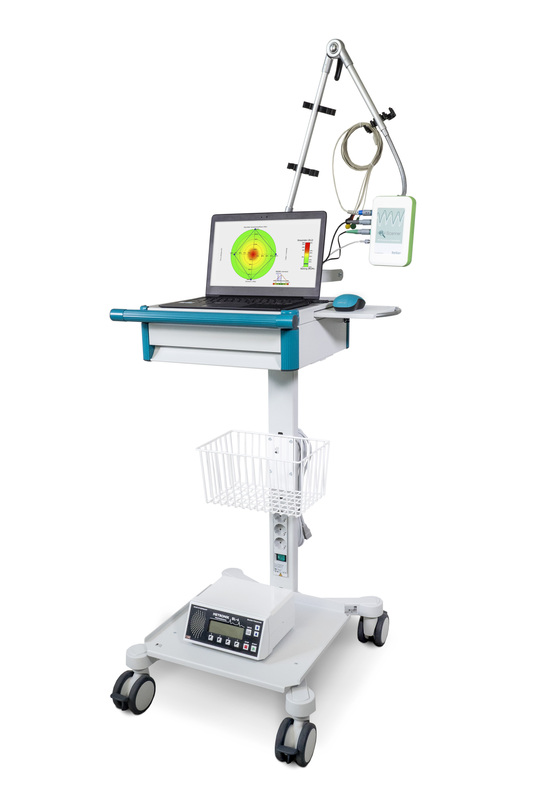 It reliably detects disturbances in the area of the vegetative nervous system (including stress) and helps in the risk assessment of cardiovascular patients. You can find information about the versions, their features and the prices here. Get a free demo for 4 weeks. Call us and get free advice on the HRV-Scanner. Do you want to inform your clients about the HRV measurement? Do you have a question about a certain measurement? – we will help you! Do you have a question regarding the technical quality or how to interpret the results? Please contact our free support by e-mail or by phone. For a fast and competent support, we have implemented an export method for the measurements in the HRV Scanner. This allows us to look at the measurements to give tips and interpretation support. Do you have a question regarding the usage of HRV in your office / institution? – we provide you with Information!